Mexico is a country of traditions. Though many of them date back thousands of years and come from the pre-Hispanic world, some were more recently born or are the result of a historical fusion of European and Indigenous cultures. 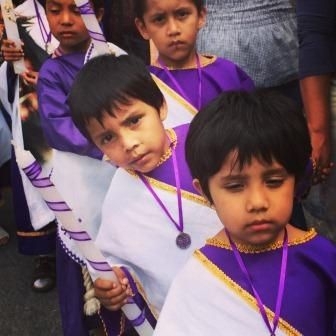 Nevertheless, few of them generate more devotion among people than the one that takes place during the Holy week in Iztapalapa, one of the 16 boroughs of Mexico City. In the centuries when the Spanish crown ruled in Mexican territory (1521-1821), the Catholic Church had the mission of evangelizing the enormous Indigenous population. The missioners used short plays in order to attract people’s attention and explain the Bible’s passages. They dramatized different scenes and involved people in these performances in order to generate real emotions. 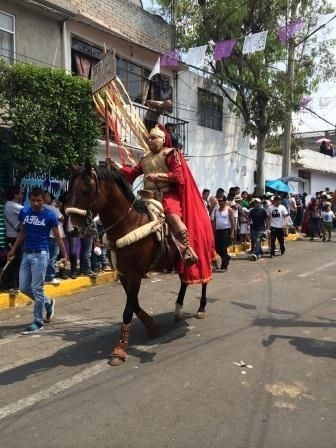 The dramatization of biblical scenes remains to this day and its biggest representation is the Passion of Jesus Christ organized by eight neighborhoods of Iztapalapa (commonly named “the Passion of Iztapalapa”).The legend says that in 1833 Mexico City faced a devastating plague of cholera that killed more than 14 thousand people in Iztapalapa in less than a year. The terrified inhabitants prayed to their miraculous religious image: the Lord of the small cave (Señor de la Cuevita). They offered to organize a mass every year if he stopped the disease. In a couple of days, the plague ceased and the population stuck to their word and celebrated the annual mass in gratitude. In 1843 the festivity changed from an ordinary mass to the recreation of the biblical passage of the Passion of Christ; since then, the tradition continues. Nowadays, thousands of people participate in this dramatization. 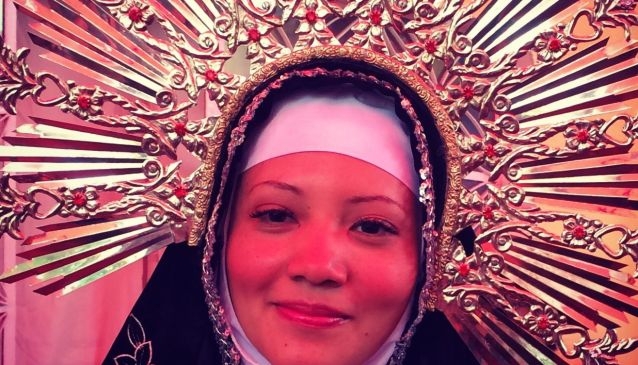 Every year, a formal Committee, composed of representatives of Iztapalapa’s eight neighborhoods, launches a casting call in order to distribute the main roles, such as Mary the Virgin, the Nazarenes, the Jews, the Romans, etc. 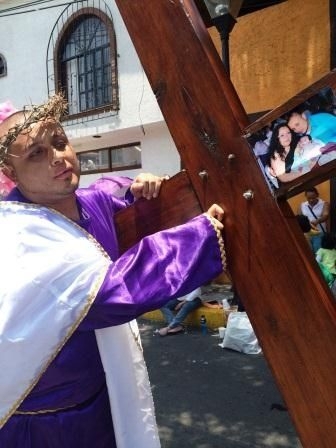 Despite strict requirements –such as being a strong single man able to carry a 90 kg wooden cross through all the neighborhoods under the sun, having catholic parents, being from Iztapalapa, and generally resembling the character- the role of Jesus remains the most coveted. The organizers and actors prepare everything during the whole year. Wigs, costumes, stages, crosses, whips, scripts… every single detail is supervised meticulously. The actors start rehearsing more than three months before and local authorities also participate by providing the means to ensure security: hundreds of policemen, street cameras, police cars, ambulances, etc. As it is the second biggest religious celebration of the country (just after the day of the Mexican Virgin of Guadalupe), everything has to be ready in order to receive more than 2 million visitors in a one-week period. 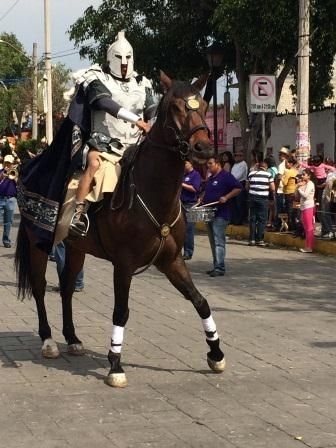 Iztapalapa is the most populated borough of Mexico City (almost 1.9 million people live there) and according to the last census, Catholicism is professed by 84% of Mexicans. Thus, it is not shocking to see that the Passion of Iztapalapa gathers together so many people per year. Although at its origin the celebration was just a local tradition derived from a local experience, in the second half of the 20th century this massive dramatization of the Passion garnered national and international attention and thousands of tourists started arriving to witness one of the biggest street plays of the world. Even if you are not Catholic or religious at all, we definitely recommend you to come and see this centennial tradition born from the people’s faith and kept for its social impact. This spectacle was declared cultural heritage by the City Hall in 2012 and is waiting to be declared world’s cultural heritage by UNESCO in order to guarantee its preservation. If you decide to come and see it, you must take into account that this is the warmest season of the year, hence you must dress in comfortable and light clothing (preferably in white), wear a hat or a cap, use a lot of sunscreen, carry liquids with you and take just the necessary belongings (even though there is going to be a huge security operative, you do not want to deal with pickpockets or other stressful episodes). In addition, we must say that during the Holy week, Mexico City gets peaceful and enjoyable. Thursday and Friday of that week are days off, for which many locals take the opportunity to travel to the nearest beaches or touristic destinations. Therefore, you will find an almost empty, unpolluted, and quiet city, with very little traffic jams. Besides, all the museums and touristic venues are preparing many activities and surprises for these days so you will have thousands of sightseeing options. With no hesitation, we can say that Mexico City is among the best choices of the world to spend the Holy week. Now, we dare you to come and discover it.